18-years old stylish, business savvy actress, Singer, and now shoe designer Zendaya has been working on her very own shoe line Daya. I first noticed the young beauty on the BET red carpet some time ago. Two things stood out to me; her unique sense of style & the way she addressed the media about her graceful exit on the lifetime Aaliyah biopic, at the tender age of 17. With that in the past the young powerhouse continues to grow right before our eyes into a business woman making the right moves for her budding career. Zendaya & Papa Law Roach have a serious case of style chemistry & this young flower is blooming. The way Zendaya is able to carry the looks her stylist Law Roach curates is a stylist dream come true. It has everything to do with how she wears her looks and the confidence in her demeanor each time she switches her style up. Zendaya has designed her first-ever line of footwear alongside her stylist Law Roach. The collection is set to be released Spring of 2016, in major shops like Macy’s. The line which is called “Daya” by Zendaya features heels, sneakers, flats and wedges, which will cost you anywhere from $125 – $175. The inspiration behind the line starts with The everyday woman and what she can effortlessly rock and afford. I have my eyes on these shoes in particular, due to the fringe around the toes, I love the way the young Starlett paired them with boyfriend jeans & a dress shirt while in Vegas at a Trade show previewing the brand. 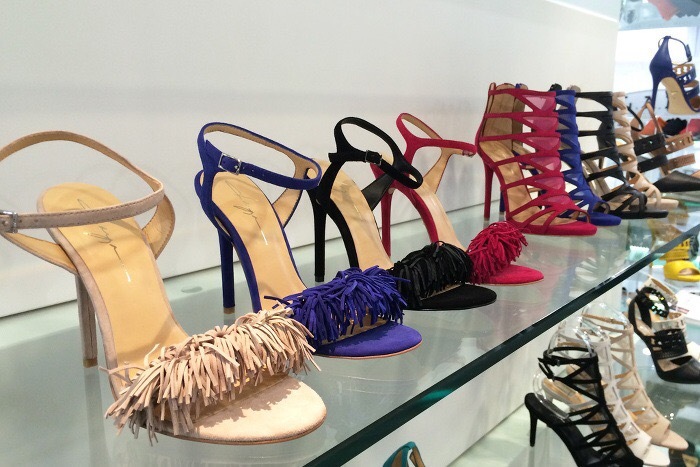 I wish the line much success & I’ll definitely be on the lookout for the fringe open toe heel.